Today we have an EasySculpt® home dec project by designer Marty Sanchez. She created a modern mirror using EasySculpt as a putty adhesive with pieces of driftwood…very cool! Step 1: Protect work area with newspaper or butcher paper. Place wood clock blank or “base” as referred to from this point forward, on newspaper or butcher paper, then trace around the outer edge of the wood base. Next position round mirror in the center of the same circle, and trace around the outer edge. This template will be used to position the driftwood pieces prior to placement on the wood surface. Step 2: Paint the wood base Neutral Gray, allow to dry. Step 3: Trim driftwood pieces to the appropriate size. Approximately 40 pieces measuring 4-6” are needed for the bottom layer and approximately 40 pieces measuring 2-4” for the top layer. 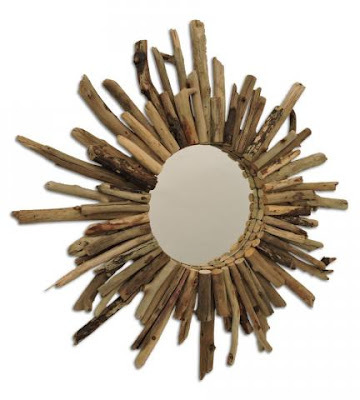 Quantities will vary based on driftwood that is available. Step 4: Starting with long driftwood pieces, place the first layer of driftwood pieces on the paper template in the desired pattern. Position trimmed end towards the mirror circle, per the above photo. Step 5: Using EasySculpt® as a putty type adhesive, mix approximately ½ tablespoon of both components A & B together per the package instructions. Divide this mixed material into three equal pieces. Form each piece into a small marble-like shape. Step 6: Place the three mixed EasySculpt® pieces on the back of the mirror creating a large three point triangle like pattern then, position the mirror in the center of the wood base. Press the mirror down gently to affix to the wood base, allow the EasySculpt® to set approximately five hours. Step 7: Again using EasySculpt® mix approximately six tablespoons (three tablespoons of both components A & B) per the package instructions. Step 8: Adhering the driftwood pieces to your wood base – begin picking up driftwood pieces from your proposed layout, add a small amount of mixed EasySculpt to the underside of each piece where it will come into contact with the wood base, position, and press. Repeat this process as required. Allow the EasySculpt to set approximately five hours. Step 9: If a second, level of driftwood pieces are desired; arrange a second layer of shorter driftwood pieces with the same paper template. To place and adhere these pieces, repeat Steps 7 & 8. Step 10: Use a toothpick to gently remove any excess EasySculpt® exposed between the driftwood pieces. Allow to cure overnight. Step 11: Fasten sawtooth picture hanger to the back of the wood base.